Touring Car – The Touring Cars were limited to an engine displacement of 2.8-liters. Vehicles originally equipped with turbocharged or supercharged motors were also homologated for the series. 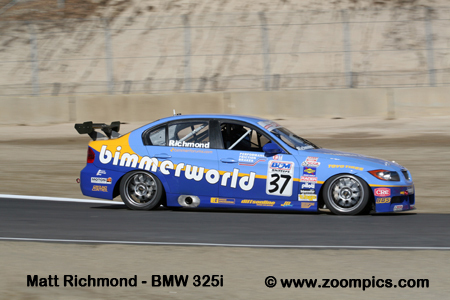 The class was split predominantly between front wheel drive cars from Acura, Honda, and Mazda and the rear-wheel-drives such as the BMW 325. Also proving very competitive was the all-wheel drive Audi A4. 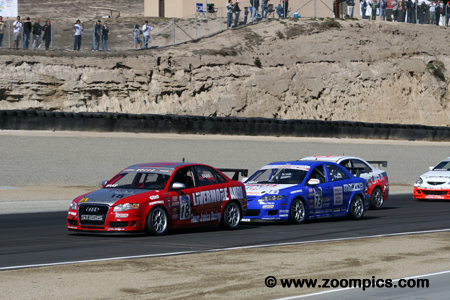 There were twenty-three World Challenge Touring Car entered for the 2007 season’s finale at Laguna Seca. 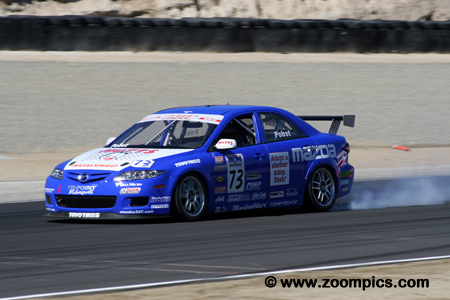 On the pole was the Mazda 6 of Randy Pobst. Next to Pobst on the front row was Peter Cunningham in the No. 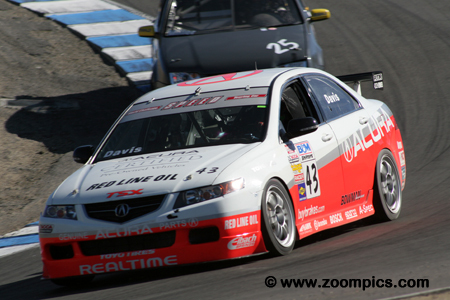 42 RealTime Racing Acura TSX. 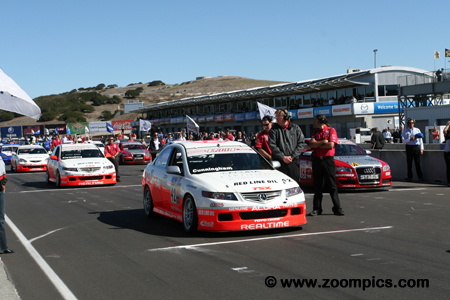 On the grid, behind Cunningham are his teammates – Pierre Kleinubing in a TSX followed by Kuno Wittmer driving an RSX. A great start by third fastest qualifier Ian Baas dropped Peter Cunningham in the No. 42 Acura to third place. Cunningham got by Baas and ran second until passed by his teammate Kleinubing. On lap-22, Kleinubing tangled with race leader Randy Pobst which moved him to first. The RealTime cars were now first and second but Kleinubing was penalized for his actions and Cunningham captured his second win of the season. Jeff Altenburg’s has an ‘off’ at turn-eleven during practice. Altenburg entered the final event with a chance of winning the championship – a fourth or better would clinch the title. He started eighth but a pit-stop for a flat tire on the first lap dropped him to eighteenth. By lap-14, Altenburg was sixth and an incident on the twenty-first lap moved him to fourth where he remained for the duration of the race. This result gave him the 2007 Touring Car title. Kuno Wittmer started sixth in the No. 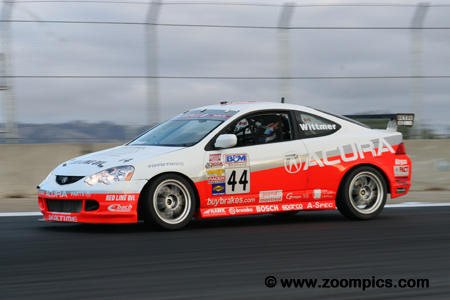 44 RealTime Racing Acura RSX. His race was not as eventful as some his counterparts but when the checkered flag flew he was second. Wittmer had nine top-ten finishes during the ten-race season. His consistent performances were rewarded with a third in the Drivers’ Championship. Chip Herr goes wide a corner-six during Touring Car practice. 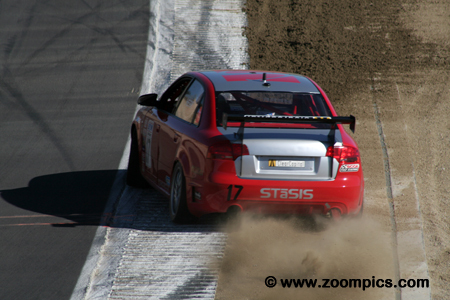 The driver of the STaSIS Audi A4 qualified seven but was classified twenty-first after an opening lap accident. During the season, Herr had three podium finishes one of which was a victory at Lime Rock. He was sixth in the final standings. Driving the No. 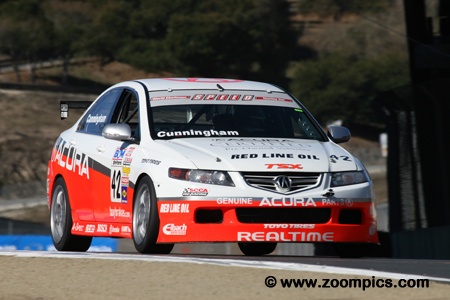 43 RealTime Race Acura TSX, Brandon Davis equaled his best qualifying effort – he started fifth at Laguna Seca and Lime Rock. Davis also scored his best finish of the 2007 season when he earned the final spot on the podium. Randy Pobst entered the season with an opportunity to win the Touring Car title. If Pobst won the race and his teammate, Jeff Altenburg, finished lower than fourth the championship would be his. It was looking good for Pobst – he qualified on the pole and Altenburg had problems on the first lap which required a pit-stop. Pobst led the race until lap-24 when he was hit by the Acura of Pierre Kleinubing. The incident dropped him to a sixth place finish and second in the Drivers’ Championship. 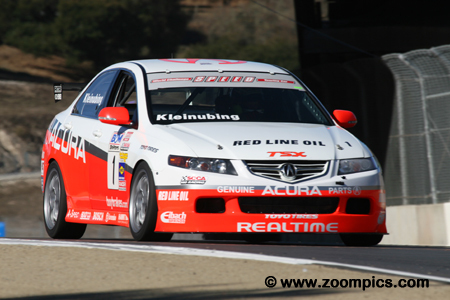 Starting fourth in the RealTime Acura TSX was defending Touring Car Champion Pierre Kleinubing. By mid-race Kleinubing had worked his way to second and was challenging race leader, Randy Pobst. In an attempt to pass Pobst, Kleinubing’s left front hit Pobst’s right rear causing the Mazda to spin and drop to sixth place. Kleinubing was in the lead but was black flagged which he ignored. He was penalized 30-seconds and finished thirteenth. First lap into corner-two and the Audi STaSIS A4 of fourth place qualifier, Ian Baas, leads the field of twenty-three cars. 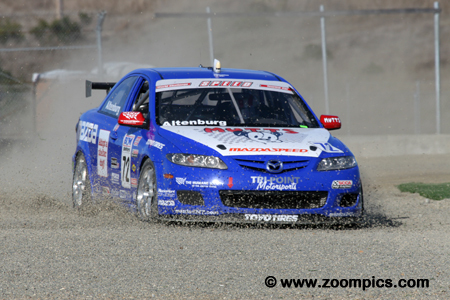 Baas’ first place would be short lived – by corner three the Mazda of Randy Pobst and Peter Cunningham in the Acura were by him. Baas dropped down the running order and was eleventh at the checkered flag.